WHY IS THE CAVE AND BASIN NATIONAL HISTORIC SITE IMPORTANT? The thermal waters found at the Cave and Basin have played an important role in the area for hundreds of years. Numerous Indigenous nations from Treaty 7 and beyond value the Cave and Basin as a sacred and spiritual place where people have gathered for generations and cultural ceremonies are still practiced today. However, in 1885, Indigenous access to the Cave and Basin was fundamentally changed. Through an Order in Council, the Government of Canada set aside 26 square kilometres of land in and around the Cave and Basin to protect the thermal springs on Sulphur Mountain for the benefit of Canadians. Two year later, this hot spring reserve was expanded to 665 square kilometres, becoming the core of the first national park in Canada. The Cave and Basin has developed into one of Banff National Park’s must-see year round attractions and one of Parks Canada’s most visited national historic sites. Ecologically, the thermal springs are among the most unique natural features of Banff National Park, providing habitat for rare plants, invertebrates and the endangered Banff Springs Snail, the most at-risk wildlife species in Banff National Park. We invite you to review the Cave and Basin National Historic Site draft management plan and help shape the future of this integral piece of Canadian History. All feedback received will be carefully reviewed and be used to inform revisions to the draft plan. Comments will be received until March 1, 2019. Stay tuned for more updates to this page. 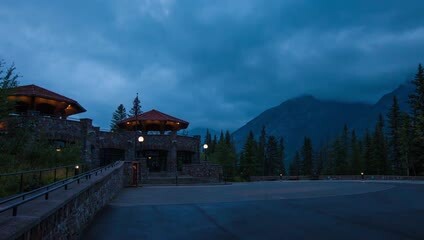 Cave and Basin National Historic Site (NHS) is located just outside the town of Banff in Banff National Park. The Historic Sites and Monuments Board of Canada recommended the designation of the Cave and Basin as a national historic site in 1981, as the Birthplace of Canada’s National Park system. The historic site encompasses the Cave, the original vent hole, the archaeological remains of the original hotel near the vent hole, the Basin, the thermal springs above and below the buildings, the Bathing Pavilion and the Caretaker’s Cottage. This management plan replaces the 2007 Management Plan for Cave and Basin which provided management direction for major improvements to commemorative integrity, visitor experience and presentation, many of which were achieved through the 2010 to 2013 Birthplace of Parks Canada renewal project. In the new plan, three key strategies are proposed to guide management activities for the Cave and Basin NHS over the next 10 years. Key strategy 1: Employing an integrated management approach to the protection of cultural resources and natural landscape features, the provision of memorable visitor opportunities and the maintenance and renewal of assets. The focus of this strategy will be an integrated approach to site operations focused on protection of cultural resources, maintenance of assets, provision of memorable experiences and protection of the site’s sensitive thermal water environment including the endangered Banff Springs Snail. Through relationships based on recognition of rights, respect, co-operation, and partnership, Parks Canada is committed to a system of national heritage places that commemorates the contributions of Indigenous peoples, their histories and cultures, as well as the special relationship Indigenous peoples have with traditional lands and waters. Parks Canada acknowledges the need to improve its understanding and recognition of the importance of the Cave and Basin to Indigenous Peoples, and how access to the site was limited for them after the establishment of Banff National Park in 1885. The primary focus over the coming years will be on relationship building with Indigenous communities to improve understanding of Indigenous perspectives and values and how these could be expressed at the site; use of the site for traditional activities; and the identification of ways to work together to increase public awareness of Indigenous cultures and histories at the site. The strategy will focus on visitor experiences that are relevant and engaging. Through public programs and partnerships diverse histories and heritage will be presented, explored and challenged. Canadians are invited to visit Parks Canada places to learn about Indigenous cultures, traditions, and customs. In doing so, we can create new opportunities for Canadians to better understand the cultures and histories of Indigenous peoples in Canada. The sense of place of the Cave and Basin will be enhanced through programs, special events, use of social media, attraction and retention of passionate staff and use of a diverse approaches to deliver interpretive programs and content. by the Chief Executive Officer of Parks Canada, 2018. The Parks Canada Agency Act requires Parks Canada to prepare a management plan for national historic sites administered by the Agency. TheCave and BasinNational Historic Site of Canada Management Plan,once approved by the Chief Executive Officer of Parks Canada, ensures Parks Canada’s accountability to Canadians, outlining how historic site management will achieve measurable results in support of the Agency’s mandate. This management plan replaces the 2007 Management Plan for Cave and Basin National Historic Site which provided direction for many improvements to commemorative integrity, visitor experience and the quality of the overall service offer. The 2018 Plan sets a clear, strategic direction for the management and operation of Cave and BasinNational Historic Site by articulating a vision, key strategies and objectives. Parks Canada will report annually on progress toward achieving the planned objectivesand will review the plan every ten yearsor sooner if required. This plan is not an end in and of itself. Parks Canada will maintain an open approach on the implementation of this management plan, to ensure that it remains relevant and meaningful. The plan will serve as a focus for ongoing engagement on the management of Cave and Basin National Historic Site during years to come. The Cave and Basin hot springs are located in Banff National Park, at the foot of Sulphur Mountain on Treaty 7 Territory and within the traditional territories of many Indigenous groups who travelled the area including the Metis. Indigenous use of places in close proximity to the Cave and Basin such as Vermilion Lakes date back to over 13,000 years ago. Human interaction with thermal water has played a central role in Cave and Basin history from the very beginning. The water is sacred to Indigenous groups. The hot springs are key to the site’s history of recreational use by settlers and travellers Recreational activities such as swimming and soaking in hot springs were seen as activities that contributed to spiritual and physically renewal. Numerous Indigenous nations from Treaty 7 and beyond value the Cave and Basin as a sacred and spiritual place where people have gathered for generations and cultural ceremonies are still practiced today. However, in the late 1800’s Indigenous access to the Cave and Basin was fundamentally changed by the establishment of the Hot Springs Reserve and subsequent park. In 1885, through an Order in Council, the Government of Canada set aside 26 square kilometers of land in and around the Cave and Basin to protect the thermal springs on Sulphur Mountain for the benefit of Canadians. Two years later, this hot spring reserve was expanded to 665 square kilometers and became the core of the first national park in Canada. In 1886, an entry tunnel was blasted into the cave. This enabled walk-in access and changed the practice of entering the cave through the overhead vent hole. The cave and basin pools were stabilized, and two bathhouses and a caretaker’s cottage were built as the first national park buildings. In 1914, a new bathing pavilion and a large open air swimming pool were added. By 1935 the Cave and Basin had become a major attraction for visitors to Banff. In response to this the facilities were renovated and further expanded. Parks officials saw the facility as an important place where Canadians could relax and find physical and spiritual renewal by bathing in the curative mineral spring waters and enjoying recreational swimming and sunbathing. Changes in national park direction, as well as physical deterioration of the buildings, led to a re-examination of the role of the Cave and Basin facility in the 1960s and 1970s. Proposals to demolish the buildings and develop an interpretive centre focused on the already established ‘birth place’ theme were rejected by the community, which felt a deep attachment to the place as a swimming pool. As a result, the site was redeveloped in the early 1980s with a new pool and auxiliary interpretive exhibits. In 1981, the site was commemorated as a national historic site. The commemorative intent is expressed in the following statement: “Cave and Basin was designated a national historic site of Canada because it is the birthplace of Canada's national parks.” Elements commemorated and protected by the historic place designation included the Cave, the Basin, the four thermal springs flowing into the Cave and Basin, the outflow to the marsh, and the archeological vestiges of the 1883 ‘hotel’ erected next to the vent-hole. The interpretive exhibits were renewed again in 1985, and the site was re-launched as part of the Parks Canada Centennial. In the 1990s a commemorative integrity statement was developed which further defined interpretive themes and identified key cultural resources and other heritage values associated with the site such as the history of bathing; the unique thermal water habitat and the Banff Springs Snail (an endangered species under the Species at Risk Act (SARA). Major improvements were made through the 2010 to 2013 Birthplace of Canada National Parks project to conserve the Bathing Pavilion, to provide new facilities (the Galletly and Welcome buildings) and to install new exhibits. These upgrades have improved the protection of cultural resources, enhanced protection of the thermal water environment and greatly enriched the visitor experience. Currently, Parks Canada’s management practice at the site focuses on: the birthplace theme; the evolution of the Parks Canada system; cross-promotion of Parks Canada protected places throughout the country; conservation of the unique thermal water habitat; protection of the Banff Springs Snail and engagement with the tourism industry. The Cave and Basin has become one of Banff National Park’s must-see year round attractions and one of Parks Canada’s most visited national historic sites. Looking forward, this management plan will support the understanding and sharing of diverse stories and values associated with the Cave and Basin, including re-interpretation of multiple historic starting points. A broad range of significant environmental and cultural conditions inform the planning and operations of the Cave and Basin. This busy year round site is located inside Banff National Park in a heavily forested setting on the lower slope of Sulphur Mountain. The site both encompasses and is surrounded by flowing mineral springs―part of the same thermal water system that feeds the Upper Hot Springs pools. The Cave, Basin, and thermal springs have both cultural and natural value for the site. The Cave and Basin has been and continues to be strongly valued from many different perspectives. For numerous Indigenous nations, Cave and Basin is a sacred place. For Parks Canada, it has high symbolic value as the birthplace of Canada’s national parks. For the local community, it is a place to gather for events and relax with family and friends. For the local business operators, the site is part of the tourism industry framework. Establishing a strategic directionthat acknowledges each of these values in context is critical to the long-term success of the national historic site. With paid visitation expected to exceed 200,000 persons in 2018/19 people management is also a year round factor. A highlight for paid visitors at the site continues to be the experience of entering the Cave. The thermal springs are among the most unique natural features of Banff national park providing habitat for rare plants, invertebrates and the endangered Banff Springs snail. This globally rare snail is the most at-risk wildlife species in Banff National Park. Its highly specialized habitat is located throughout the site including above and below the buildings, inside the cave and in the basin. Other species at risk, such as the special concern Western Toad and Vivid Dancer also regularly occur at the site. The thermal waters also create a challenging environment (Hydrogen sulphide gas, Radon, freeze/thaw) for the protection of cultural resources. The Middle Springs Wildlife corridor is located directly above the site. This 500 metre wide band of forest helps large carnivores move across the Bow Valley, and around the town of Banff. Wildlife also routinely pass through the designated area of the national historic site, creating both an exciting visitor experience and the requirement to carefully monitor public safety at all times. The Cave and Basin Marsh zone is located both within the designated area of the site and flowing out below it into Vermillion Lakes. This location is the most important habitat for snakes in the park. The Vermillion wetlands and the Cave and Basin marsh constitute the most productive bird habitat in the lower Bow Valley. The sites 0.5km lower boardwalk provides visitors with the opportunity to experience this sensitive wetland area and develop a deeper sense of connection to both the environmental and cultural aspects of the site. Between 2010 and 2013 13.7 million dollars was invested in the renewal of the site. Closed for 2.5 years the site reopened in May 2013. The renewal was not limited to the facility—it also included changes to the overall visitor experience program, development of new revenue generating activities and strategic re-positioning with respect to the Bow Valley community, the tourism industry and other partners. Capital improvements focused on improving the sense of arrival in the Cave and Basin parking lot, as well as major updates to the Bathing Pavilion complex and areas immediately outside that structure. Key changes included removal of the second-floor exhibit in the Bathing Pavilion to make way for the creation of the much larger Story Hall exhibition space. Principles of adaptive reuse and conservation guided the main building’s renovation. Another key action was the construction of the brand new Welcome Building (located next to the parking lot) and the Galletly Building (situated within the Bathing Pavilion complex). The renewed on-site visitor experience begins on the entrance road, out of view of the national historic site. The Welcome Building and orientation plaza in the parking lot contain way finding, interpretive information, washrooms, a gift shop and a Parks Canada reception desk. Within the core of the site, the Bathing Pavilion Complex contains the 1914 historic Bathing Pavilion building, the cave spring pool, the basin pool, the 2013 Galletly building and a large outdoor deck used for open air programs (the former location of the swimming pool). An enduring theme with visitors is the desire to touch the warm mineral spring’s water (which is generally not possible for habitat protection of the Banff Springs Snail). During the renewal project, a small water feature was installed near the entrance of the Bathing Pavilion. The intent was to respond to visitor demand via a “critical habitat protection tool” (i.e., a fountain allowing visitors to touch the water in a controlled environment instead of inside the cave where it may impact the snail). However, the current touch feature has proven to be ineffective; it is poorly located, mechanically problematic, doesn’t function in winter, and lacks a sense of authenticity. The interior of the buildings at the Bathing Pavilion Complex contain a wide selection of interpretive exhibits and digital media presenting content on local, Indigenous and Parks Canada history. This content includes a four-screen high definition video profiling the Parks Canada system of protected places, and the brand new (2018) Imagine a Country interactive exhibit, which invites visitors to express what conservation means to them. The Bathing Pavilion Complex offers a variety of other amenities as well, including scenic view decks, a theatre for showing films and hosting events, a small rotating exhibit space, and an informal “library” sitting room for relaxing, reading, playing games or attending presentations. The pool deck functions as a large open air four season exhibition and activity space for programs, temporary exhibits and special events. During the renewal project, Parks Canada staff engaged with representatives from the Stoney Nakoda, Ktunaxa and Siksika Nations to develop content for new exhibits. This content communicates the represented Indigenous perspectives on the Cave and Basin site itself as well as Parks Canada more generally. Since reopening in 2013, the Cave and Basin has occasionally been used for traditional ceremonial practices, and is frequently visited by Stoney Nakoda school tours and other groups from Indigenous communities. None of the exterior interpretation and infrastructure of the upper and lower board walks (1.0km total), including thermal water infrastructure dating back to the 1980’s fell within the scope of the renewal project. This infrastructure is in need of recapitalisation. The boardwalks are over 30 years old, with many of the wood pilings showing major signs of deterioration. The faded interpretive panels are of the same era. In spite of their condition, the boardwalks continue to be an important part of a visit to the Cave and Basin. They provide a serene outdoor experience, viewing access to the thermal waters; wetlands; the vent hole of the Cave and rare flora and fauna of Banff National Park. Visitors can access all of the boardwalks for free. Paid access is limited to the Bathing Pavilion Complex. A 2017 Commemorative Integrity Evaluation and State of Site Assessment determined that, overall, the cultural and natural resources at Cave and Basin are in good condition, and the archaeological sites are in stable condition. While the landscape and built heritage features of the site are generally in good condition, the corrosive thermal water environment and the constant flow of thermal water on and around the building foundations threaten various long-term impacts and requires constant attention. The Cave, the Basin and the four natural springs that flow into the Cave and Basin are all landscape features of national historic significance. These features also comprise critical habitat for the endangered Banff Springs Snail. Management and control of the thermal water flow has been a central operational concern since the site’s early beginnings. Cultural resources including the vent hole, the 1883-85 archeological hotel remains, and the 1914 Bathing Pavilion (a classified FHBRO Building) are all threatened by high moisture levels, corrosive minerals in the water, and an extreme freeze/thaw cycle. Major conservation work (e.g., repointing of rundle stone and masonry repair) has been performed on the Bathing Pavilion over the last 8 years. Parks Canada is committed to working in partnership with Indigenous organizations, communities, and individuals to strengthen the commemoration, celebration, and presentation of Indigenous histories at the Cave and Basin. Indigenous communities advise, influence and contribute to the site’s programming. These communities also access the site for traditional and cultural practices on a year-round basis. Indigenous tourism and experiences offer the opportunity to advance understanding and appreciation of Indigenous cultures and heritage in Canada while providing economic opportunities for local communities. With the exception of 2017, visitation numbers are based on paid entries only. Since reopening in May 2013, Cave and Basin has enjoyed the fastest growth in visitation of all national historic sites administered by Parks Canada. In 2013/2014 visitation was 91,282. By 2016 this number had increased to 179,415. During 2017 (the Canada 150 year), visitation reached 267,951. Cave and Basin National Historic Site is now among the most visited historic sites in Canada. The 2018 management plan calls for development of a visitor experience strategy for Cave and Basin by 2020 (see section 5.0 below). As part of this process, Parks Canada team members, Indigenous partners and stakeholders will complete a critical review of the existing interpretive exhibits and programs. During this process, particular attention will be paid to design functionality, relevance of content and messaging. Indigenous reconciliation and respecting Indigenous rights will be an important lens for this process. Diversity/inclusion, incorporation of multiple viewpoints and perspectives, and physical condition/state of repair of exhibits will all be assessed. As many of the exhibits are digital and/or interactive, a technology recapitalisation plan will be an important part of the Visitor Experience strategy. Cave and Basin has diversified its programming and revenue stream in recent years. Elements related to this expansion include after-hours heritage venue rentals, year-round tourism industry collaboration, and high-profile, partner-driven special events. The high season at Cave and Basin is characterized by independent travellers and group tours. The low season is active with meetings, and conference bookings, and after-hours private functions. Awareness of the site is at an all-time high with respect to community relations. The site is widely promoted as a must-see attraction throughout Banff National Park. The Cave and Basin National Historic Site is an iconic gathering place for sharing stories about people and the land over time. Cave and Basin is symbolic of the entire Parks Canada system―its many ideas and initiatives, successes and challenges, stakeholders and perspectives. As a must-see cultural attraction in Banff National Park this location is an ideal place to connect with Canadian and international visitors on a year round basis. When visitors explore the Cave and Basin, they are struck by the uniqueness of the thermal water environment, its importance to Indigenous peoples, and its rich post-contact settler history. One major highlight is walking through the tunnel into the cave. It is here that visitors experience a sense of enchantment and discover why this cavern has deep multi-layered meanings for Indigenous peoples and Parks Canada. Indigenous communities advise, influence and contribute to the site’s programming. These communities also access the site for traditional and cultural practices on a year-round basis. Elsewhere onsite visitors are delighted by authentic and engaging experiences that showcase Parks Canada people, places and stories from across the country. Special events, partnerships, community gatherings, volunteering and related activities further expand the reach and diversity of Cave and Basin programming. Significant cultural resources, built features, unique thermal spring ecosystems and the endangered Banff Springs Snail are protected and secure. As the birthplace of what has now become the largest conservation system in the world, Parks Canada showcases how it integrates the protection and presentation of significant cultural resources and sensitive environmental habitats at this treasured national historic site. Cave and Basin National Historic Site is a culturally and ecologically complex area with sensitive features that has rapidly growing visitation. The asset inventory is varied and in need of ongoing maintenance. This strategy will apply an integrated management approach to the protection of cultural and natural resources, the maintenance and renewal of assets, and the achievement of memorable visitor experiences. The primary goal is to support and contribute to the long-term protection of the site’s archaeological and built heritage resources, sensitive thermal water environment and the endangered Banff Springs Snail. The site’s natural and cultural landscape, built heritage resources, archaeological sites and species at risk are all carefully monitored, and mitigations are put in place if threats are identified. A Fire Smart Assessment is to be undertaken by 2020. By 2021 a cultural resource strategy with a landscape maintenance component is completed. By 2022 a historical research plan and inventory of records that support cultural resource management and interpretive programs is completed. This plan is enhanced by research and knowledge gathering initiatives led by Indigenous nations. The density of non-native vegetation is reduced below 2017/18 levels. By 2023, a project is undertaken to examine the anchors and condition of the back wall of the Bathing Pavilion to ensure that thermal water is not pooling against the wall. By 2028, cultural resources of national historic significance and the FHBRO designated Bathing Pavilion building show an improving trend in the State of Assessment, compared to the 2017 State of Assessment. The sense of arrival to the national historic site is improved. By 2021, a feasibility study and options analysis be completed to consider constructing a new thermal water touch feature. By 2021, way finding signage to the site, vehicle signage in the parking lot and interpretive panels by the Welcome building are reviewed and improved. In the first years of the plan, the commissioning of a symbolic installation or iconic artwork for the forecourt area or near the Welcome Building is undertaken that speaks to the many histories of the site. Multi-year investment plans are crafted to ensure that the maintenance, repair and recapitalization of the aging thermal water infrastructure, boardwalks and contemporary building assets are prioritized and addressed in a timely fashion. By 2020, conservation repairs are completed to the South Belvedere and view deck of the Bathing Pavilion. By 2021, the Parks Canada administration space within the Caretaker’s Cottage is upgraded to improve health and safety factors and work conditions. By 2021, an engineering assessment is completed evaluating the condition of the thermal water infrastructure and boardwalks including cultural and archeological resources. This work will require an environmental assessment that ensures compliance with SARA. By 2022, complete a detailed long term site asset management plan, outlining all major recapitalization projects required over the next 15 years to allow for the sustainable operation of the site. This plan will include accessibility requirements. By 2023, a public view deck is re-instated on the roof of the Bathing Pavilion. This strategy focuses on working with Indigenous Peoples to build relationships that demonstrate leadership in reconciliation, based on a recognition of rights, respect, co-operation, and partnership, to contribute to collaborative initiatives. Foster opportunities for the Cave and Basin NHS to be a platform for Indigenous voices sharing Indigenous perspectives and stories. Parks Canada and Indigenous partners collaborate to understand the diverse values and stories of the Cave and Basin, both historical and contemporary. Target to be developed through discussion with Indigenous nations. In the first years of the plan, Parks Canada will work with Indigenous communities to develop an Indigenous-led process to better understand the values and stories connected to the place. By 2020 invitations have been extended to Indigenous communities to discuss approaches to story sharing related to the site and to help understand what protocols should be applied when sharing Indigenous stories or knowledge with the public. By 2021, a review of the current interpretive media, with a lens of reconciliation, is undertaken in collaboration with Indigenous partners. This process will identify areas of concern related to bias and omission and will inform the development of the Visitor Experience strategy. Cave and Basin National Historic Site is a place for reconciliation, sharing of Indigenous cultures and stories from Indigenous voices, Indigenous economic opportunities, a place for Indigenous community gatherings and events and where Indigenous and non-Indigenous communities come together. In 2020 (and as part of the 2018/19 consultation process) options to establish an Indigenous Advisory Group for Cave and Basin are explored; this group would provide advice on relationship building with Indigenous nations, protocols for Indigenous participation and knowledge sharing, program development and public outreach. By 2021 operational protocols are developed to respect traditional Indigenous use of the site. On an annual basis team members working at the site receive reconciliation training, such as the Kairos Blanket Exercise, to foster a culture of understanding and reconciliation. Indigenous relations are rated as good in the next State of the Site assessment, to be completed in 2028. Indigenous people participate and benefit from economic opportunities arising from the operation of the site. By 2019, the site staff are active participants in Banff Field Unit Human Resources recruitment activities that target Indigenous communities. By 2022, opportunities to operate an Indigenous business are solicited and hiring of Indigenous site employees is pursued. By 2022, there will be one export-ready visitor experience owned and operated by an Indigenous group or company that operates from or collaborates with the Cave and Basin. This product will be promoted by the Banff Field Unit and Parks Canada. This strategy aims to enrich visitor experience opportunities at Cave and Basin through visitor experience planning, development of new programs, and establishment (or renewal) of key partnerships with people, organizations and groups. Visitors will be inspired by an enriched daily offer, and will be encouraged to return often for special events and programs, temporary exhibits, community gatherings, participatory and lifestyle activities, or to simply relax and enjoy this special place. Visitors are inspired by the site’s natural and cultural richness, and by the diverse and inclusive approach to storytelling, information sharing and hands-on participation as demonstrated through staff and partner-led programs. An important initiative is the development of a new Visitor Experience Strategy (VES). Assembling a comprehensive team of internal field unit and national office stakeholders at critical stages of the VES development can ensure a properly integrated planning approach. By 2021, a new visitor experience strategy (VES) is developed for Cave and Basin. The VES will help to inform future investments to infrastructure, refreshing of the main exhibits and interpretive programs and strategic partnering opportunities. By 2024, 90% of visitors surveyed (VIP Survey) report being satisfied and/or very satisfied with their trip-planning and arrival experience and enjoyment with their overall visit to the site. By 2024, 90% of visitors surveyed leave with a deeper appreciation of the role of Cave and Basin National Historic Site with respect to the diverse histories connected to it, and to its meaning and value to all Canadians. Throughout the life of this management plan field unit staff will collaborate with national office staff on digital products as needed to adjust and improve presentation platforms including considerations of accessibility, diversity and inclusion. Canadians are invited to assist Parks Canada with the appreciation and stewardship of the rich cultural and natural heritage resources protected within the Site’s boundaries. By 2021, the Cave and Basin will offer new opportunities for visitors to increase their awareness and ecological knowledge about species at risk. A greater number of volunteer opportunities exist, compared to 2015/2016. The site is widely regarded as a core destination within Banff National Park. Parks Canada continues to develop, implement and market exciting integrated cultural tourism experiences throughout the year. Visits are increased through promotion of the site in cooperation with partners. Visitors learn more about other Parks Canada places. At least two partner driven events occur each year. By 2021 strategies are in place to pursue an increase in visitation in the shoulder and winter season. Cave and Basin works in partnership with other BFU departments to and the Upper Hot Springs to develop new enhanced visitor experiences at different price points, such as tours, packages and promotions. Over the next five years, revenue from after-hours rental increases by 15% beyond 2016/17 levels. Cave and Basin specific posts within the Banff National Park social media platform increase by 5%/year over the course of the plan. More visitors come more frequently and stay longer. By 2028, there is a 30% increase in visitation over 2016/17 levels. Parks Canada is responsible for assessing and mitigating the impacts of management actions on ecosystems and on cultural resources. The Cabinet Directive on the Environmental Assessment of Policy, Plan and Program Proposals prepared by the Canadian Environmental Assessment Agency, requires a strategic environmental assessment of all plans and policy submitted to the federal Cabinet or to a Minister for approval deemed to have important positive or negative environmental effects. A strategic environmental assessment (SEA) was conducted for Cave and Basin National Historic Site Management Plan pursuant to the 2010 “Cabinet Directive on the Environmental Assessment of Policy, Plan and Program Proposals” (CEA Agency/Privy Council Office 2010). Strategic Environmental Assessment provides an opportunity to identify broad and unintended impacts of proposed management actions resulting from a proposed policy, plan or program, including the cumulative environmental impacts of multiple activities. Strategic environmental assessment also informs the subsequent assessment of related projects. The spatial scope of the SEA included areas within the boundary of Cave and Basin National Historic Site, and the temporal scope was a period of ten years from the date of plan approval, at which time the plan will be reviewed. The resources considered to be Valued Components are the cultural resource elements commemorated and protected by the historic place designation, the historic buildings, the thermal spring environment and the marsh below, and the endangered Banff Springs Snail and their critical habitat. Visitor experience resources including the various facilities are also important resources considered in the assessment. The management plan includes a number of important initiatives to build relationships with Indigenous peoples, demonstrate leadership in reconciliation and create opportunities for strengthening diversity and inclusion. These initiatives will help create understanding of Indigenous values of the site and will help tell a more complete story of the site to Canadians. The management plan calls for an engineering and environmental scoping study by 2019 to assess the feasibility of construction of a new thermal water touch feature at the site. The environmental scoping study can ensure that environmental issues including Banff Spring Snail concerns are properly addressed. Indigenous values at the site should be considered in planning the new thermal water touch feature. An important initiative in the management plan is the development of a new Visitor Experience Strategy (VES). Assembling a comprehensive team of internal stakeholders at critical stages of the VES development can ensure a properly integrated planning approach. Indigenous values at the site will also be incorporated into the VES. A significant positive effect of the Management Plan will be to expose Cave and Basin National Historic Site to many more visitors, improving awareness and appreciation of the heritage value of the site. Enhanced stability and conservation of the resources at these sites will contribute to the mandate of the Agency and overall quality of the visitor experience, as will improvements to contemporary visitor facilities. Any potential negative environmental effects from increased visitation can be mitigated through the use of existing policies and instruments and by carefully managing visitor use of the areas. Project-level impact assessment will be able to mitigate any potential adverse impacts from individual projects resulting from this plan. If the appropriate mitigation measures are applied, there are no important adverse environmental effects anticipated from implementation of the management plan. The overall environmental effects of the strategies, objectives and targets of the plan are expected to be positive. What role does Parks Canada play in the management of national historic sites? Why does the Cave and Basin National Historic Site have a management plan and what does it do? What will be included in the new plan? The comment period is now open to March 1, 2019. Parks Canada looks forward to hearing from you! The comment period is now closed and the feedback received is under review and being used to refine the draft management plan. The summary of what we heard from the consultations and the final approved plan can be found here.